Post Mortem for Dr David Kelly, the Bio-Weapons Expert who "took his own life with a blunt pen-knife and a packet of Aspirin", a few days before giving evidence which concluded that Saddam Hussein had no WMD (labeled Made in the USA) has been shut away for 70 years. Have you ever spoken to anyone who has not said "this man was murdered by the Tony B. Liar Government"?? How much of the ongoing IRAQ INQUIRY is aired on TV in the UK and in the US? Alastair Campbell ( Tony Blair's Former director of communications) is to face questions over his role in compiling the dossier on Saddam Hussein's supposed weapons of mass destruction. Is this guy for real? "I never assumed ... use of military force ..." bah uh er stammer stammer ... this is really spooky. And Alastair Campbell actually says the war was hugely unpopular, that parliament was opposed and he shrugs and murmurs that - yes, it was somehow "difficult"? Have these guys ever been told to f#ck off? "well, I'd really LIKE to do my job, but see I was in this difficult position where I could represent my constituents - as it is my job to do - OR ... and listen to this ... OR, I could receive handshakes and smiles from my friends at BAE systems and get some sort of tin trinket from my buddy Rummy. Aye, aye, I know what you're thinking... do your job instead pursue personal gain at the expense of the blood of hundreds of thousands of innocent children. But what if I was so CRAZY ... so VERY CLEVER ... that I could actually do my job by NOT DOING MY JOB!!! Isn't that mad? Isn't that absolutely marvelously mad? Well that's how I see my position. I'm so brilliant that I'm a moron that starts wars. Vote for me!!" "You have said that...you will basically dare to do whatever the prime minister (Tony Blair) asked you to do...Would that be accurate?" "Look, if he asked me to jump off a building I wouldn't have done it...If he asked me to do anything that I thought to be silly or improper, I wouldn't do it..."
Everyone agrees that the Iraq "INQUIRY" is a whitewash. What is needed is a full-blown International War-Crimes Tribunal at the the Hague - that Chris Coverdale and many others have been demanding. 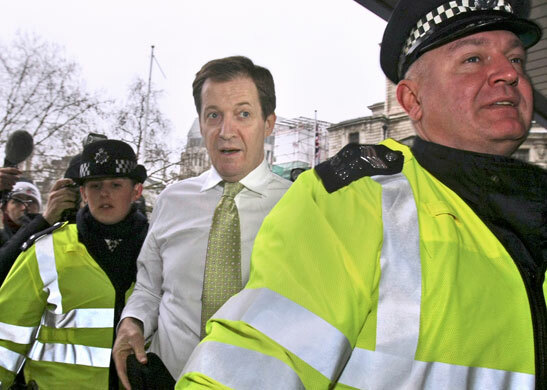 Alastair Campbell was a pornographer for a cheap magazine before entering government. The problem with The Hague and their lofty-sounding War Crimes Tribunals is that it's all the same group of guys calling the shots behind the scenes. Invariably who lives and who dies-- or, who rots in jail and who is set free-- is decided beforehand, for reasons of political expediency, and a couple of select victims are trotted out for public display. The hand picked 'elite' judges determine the fate of the unlucky show-trial victims. Have you ever gone to your mailbox and been selected for jury-duty at The Hague? These sorts of institutions are Old Boy's Clubs populated with the very same cast of characters who order the commission of the war crimes in the first place. Was old Slobodon Milosevich any worse or better than any of these other criminals? If you find yourself speeding towards a crosswalk as Alistair Darling and Tony Blair happen to shuffle across the street, you just might want to sneeze or change the song on the radio or adjust your rear-view mirror. Once you get to the higher echelons of bureaucracy there aren't any 'fair trials' anymore: it's all political. That's why these Darling people busy themselves with dossiers to justify their armies and private military contractors. Fundamentally, they're common street thugs and bullies. But because of their friends in high places, they're effectively above the law and will do whatever they think they can get away with. All you need is a wooded trail and some aspirin and a pen knife to level the playing field. 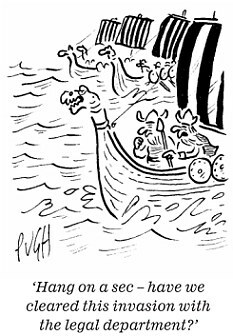 Rocks, sticks, stones, ropes... even a punch in the nose. The reason the TV-watching public is treated to fake "shoe throwing" and "statue throwing" videos is so that viewers will be deceived into thinking that such tactics don't work. I can assure you that if Alistair Darling thought even for a moment that he might get punched in the nose or run down in the streets because of his actions, he would have found his assistance to Mr Blair's mass-murder campaign "improper and silly" and he wouldn't have been a willing participant. If Blair and Darling were to get bumped on the head by falling flower-pots or slip and fall down some stairs, I'd consider it a good thing for England, the World, and all civilised society. Let them dance with the angels in heaven with all the victims of their bombing campaigns while their employees write maudlin tributes on fake memorial sites. I largely agree Fred, there could be only one outcome from a real genuine War Crimes Tribunal and that would be the Death Penalty for all and sundry. That includes the so-called queen of England. She is CIC of the Uk's Armed For....I mean Terrorists. The failure of the PTB in arranging such a Tribunal is testimony to what you say! PS A very large flower-pot Fred! Robin Cook also took a timely dive, less than a month after his public responses to London’s 7th July Event. He wrote in The Guardian on the 8th. He stated that Al Q was a CIA invention, but implied that the London Bombing was evidence of its activity; hard to imagine that the former Foreign Sec hadn’t noticed or been informed that 9/11 was planned and executed by his own countymen, and 7/7 was likely more of the same. But he also said that a war on poverty might do more for western security than a war on terror, and had received a standing ovation in the Commons for his anti-invasion resignation speech of 2003. Seems likely he had go by royal decree. I wonder also about John Smith’s death, being the chief threat to Blair’s Leadership that he was at the time. Devastating evidence at the Iraq inquiry yesterday revealed that every senior legal adviser at the Foreign Office believed the conflict was in breach of international law. Robin Cook : Two weeks after announcing his resignation in Parliament and in his farewell speech he tells us that "Al Quida" was a Database, he is found dead out hill-walking. Which tells you something about the man's lifestyle. He was one of the fittest men in Parliament by all accounts. A friend of mine met him on the Burren in Ireland, a wild remote lunar landscape, a favourite place among walkers and hikers. "Now Lord Hutton has backtracked and has said the doctors will be able to see the records - as long as they do not make information public that could cause distress to Dr Kelly's family." I doubt it unfortunately! It will be a whitewash, like all it's predecessors, and the Daily Mirror reading families of the dead British Terrorists will get the "I simply say to you [fill in here]"; and the old NLP "hand-treatment" from Blair and exeunt! Sadly, I must second on the Hague. My visits to and stays in the lovely city have revealed too many stories circulating around about the politics of this movement for a "world tribunal". The system which necessitates a world tribunal is the system that props it up. Paradox. "Underworld order" as its been called. I have also gotten more than one tip about the unpleasant influence of NGOs. Seems they are corporate gangs in disguise as disinterested parties. That's partially the reason I stand firm on our MITRE findings. It fits very well with the sad stories of NGO influence on big politics.